Travel with teens is not at all like family vacation with little kids. Teenagers have opinions and interests of their own. And that changes things! A successful trip with teens starts with involving them in the vacation planning from the beginning. Do stuff they like — and they’ll be happy to do what you like, too. 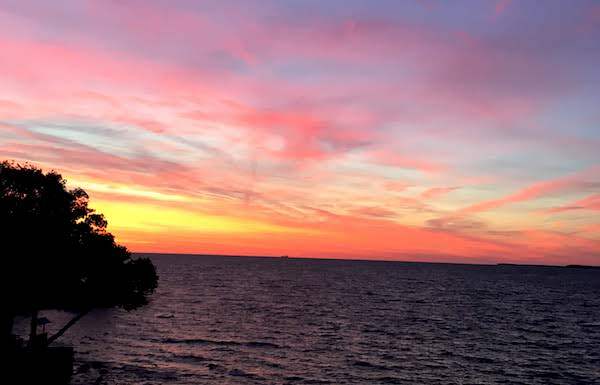 Make it easy on the chief travel planner and pick destinations that have lots of options, like Put-in-Bay, Ohio. An Ohio native, I love Lake Erie and the shores and islands of northwest Ohio. 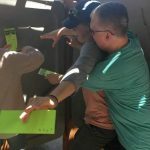 So, planning a family vacation to share it with my kids was lots of fun. 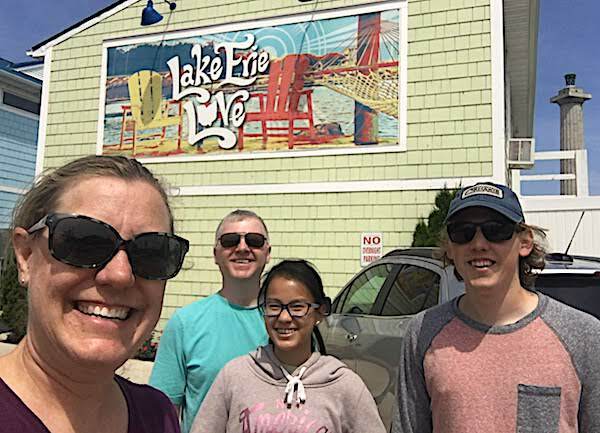 When the kids heard all there is to do on South Bass Island and the town of Put-in-Bay, they jumped in enthusiastically to plan our day. 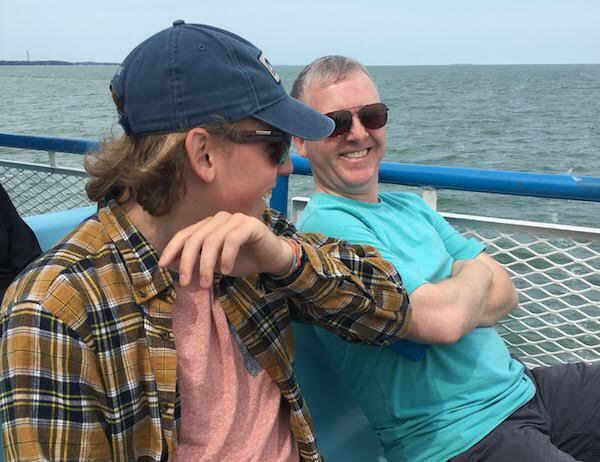 So, to make it easy on the chief travel planner in your family, here are the best things to do in Put-in-Bay with teens! My kids full endorse this itinerary. The easiest way to get to South Bass Island is with Miller Ferry. They launch from Catawba Island in Port Clinton, Ohio pretty much non-stop from March to November, weather permitting. While you can take your car to the island (it’s $34 round trip), we think it’s a lot more fun to explore the island by golf cart. Pedestrian ferry crossing is $15 roundtrip for adults, $3 roundtrip for kids ages 6-11 and free for kids under 3. You pay the people fare even if you take your car. 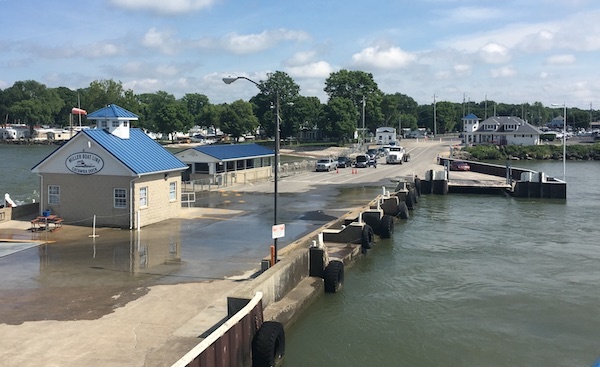 Put-in-Bay weather can delay or cancel the ferry — which happens a few times a year at most. You can purchase pedestrian ferry tickets in advance, but cars are first-come, first-served and tickets cannot be purchased in advance. You just line up once you get there and take the next ferry that has space for your vehicle. We stayed on the island overnight and opted to take our car across. If you’re staying on the island and plan to cook some of your own meals, taking your car is probably easier. But, if you’re going just for the day, rent a golf cart. Using your car on the island is quite a challenge as parking options are limited. There are several places to rent Put-in-Bay golf carts near the ferry. 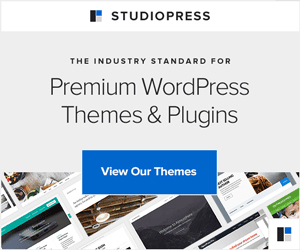 It’s best to rent online in advance, because most offer online rental discounts and because they can sell out on busy days — especially weekends. If you’re staying in a vacation rental on the island, check for even greater savings (sometimes). 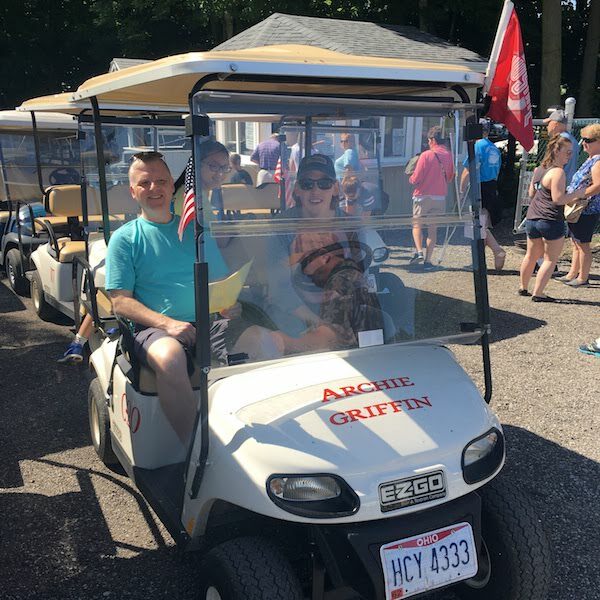 We got our golf cart at E’s Put-in-Bay Golf Carts because I won the rental in a twitter party last summer (social media for the win on that one)! As we walked up to the rental counter, my son spotted the Archie Griffin golf cart — E’s Golf Carts has clever names for all their golf carts — and offered me “bonus points” if I got that one. At the counter, I filled out the rental contract, presented my driver’s license and provided a credit card in case we damaged the golf cart. I explained that I got major mom points if I could have the Archie Griffin cart, and he handed over the keys. Score one for Mom! You have to be 18 with a valid driver’s license to rent a golf cart on the island. Golf carts are “street legal,” and must obey all traffic laws just like a car. Be courteous. Drive closer to the edge of the road when possible so that cars can pass. Once we had our golf cart, we set off on a daylong adventure that we won’t likely forget. Located in the middle of the island at 979 Catawba Ave., Put-in-Bay, we planned to spend about an hour here. We were there for more than three hours — by choice! Score TWO for mom! 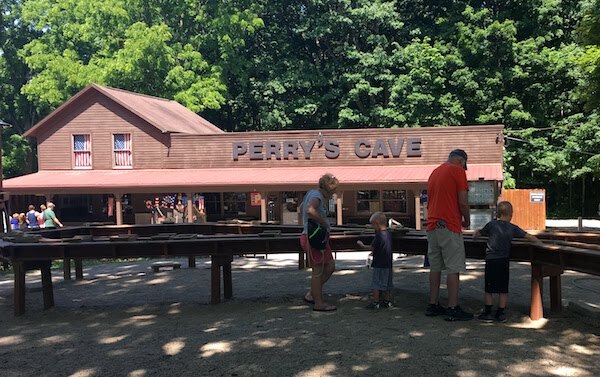 Perry’s Cave Family Fun Center has a number of activities the whole family can enjoy. We had combo tickets that let us choose three of five paid activities: The cave tour, the rock wall, miniature golf, Fort aMaze’n (like a corn maze without the corn) and the Butterfly House. There’s also an antique car museum (always free), gemstone mining (prices vary) and a snack shack. 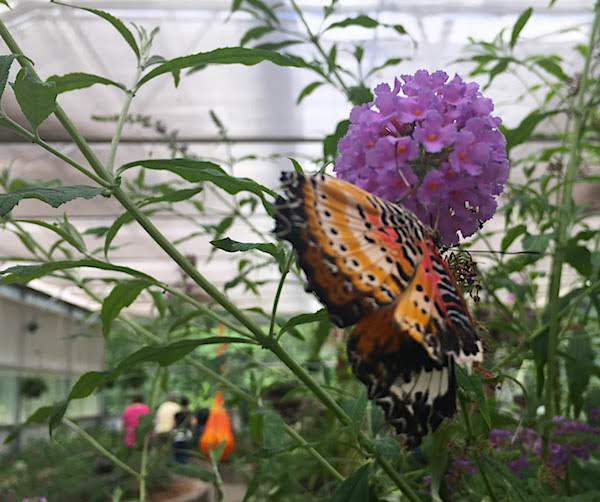 We have been to many butterfly houses before, so we decided to skip that one, too. Though, the staff let me in long enough to take a few photos for this post (thanks!). 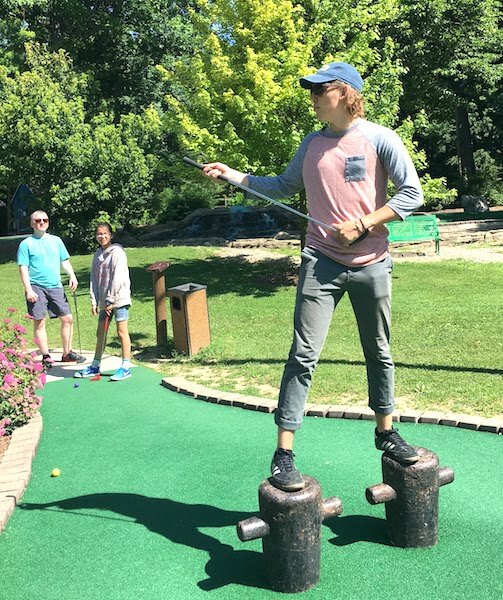 Our first stop was Miniature Golf. 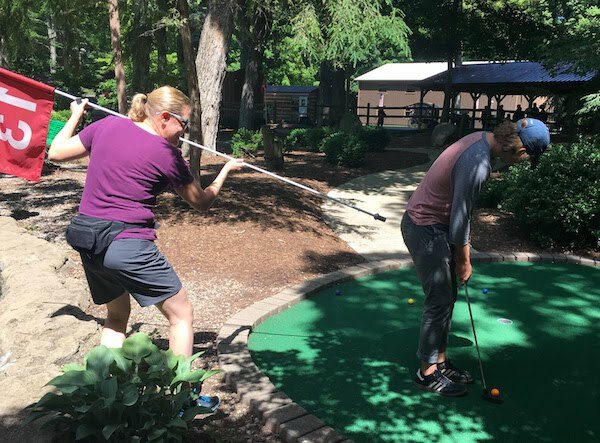 No surprise, really, because we play putt-putt just about everywhere we go. This course is among the best we’ve ever played. 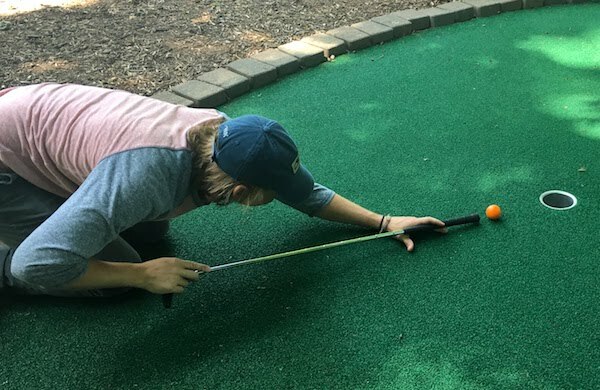 Each hole is challenging, though doable. The landscaping, cave, waterfalls and “river” provide a beautiful backdrop. Pro tip, get there early to avoid the crowds and midday heat. 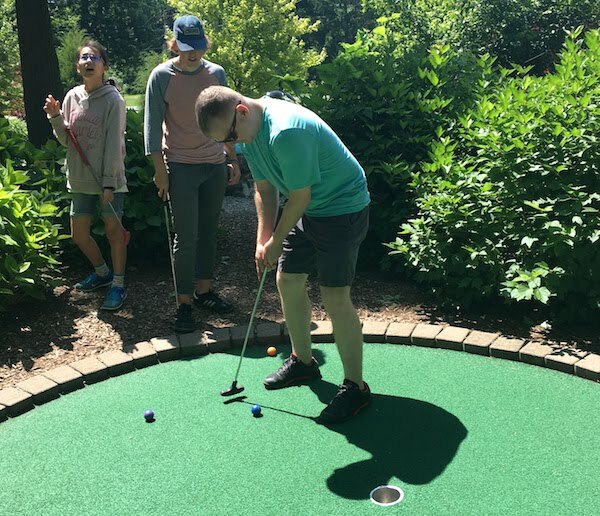 Miniature golf with a 20-something… real life! Do what you’ve got to do to win. Right? 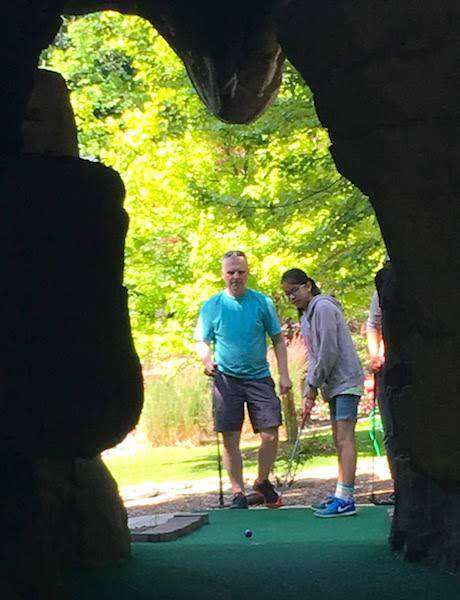 After our game (I lost to Rob by only one stroke — so close, and yet, so far), we headed to Perry’s Cave, a natural limestone cave that played a pivotal role in the Battle of Lake Erie during the War of 1812. 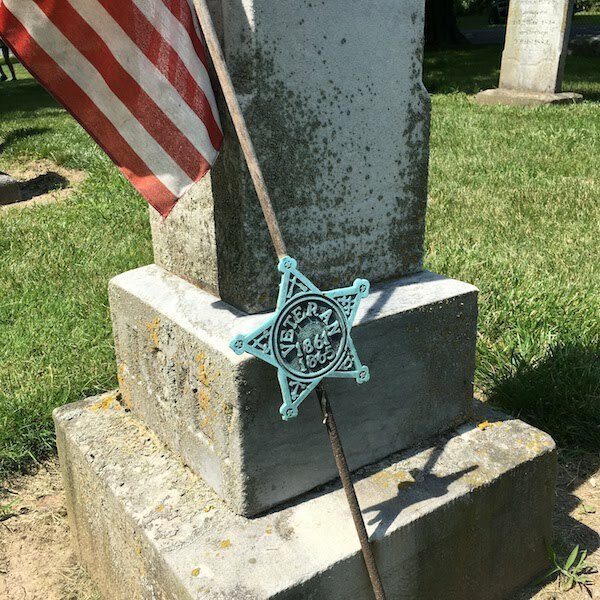 Our guide was fun — balancing the cheesy jokes with real history to entertain guests of all ages. The staircase down to the cave is a bit treacherous. I don’t recommend this tour for people who need assistance walking. 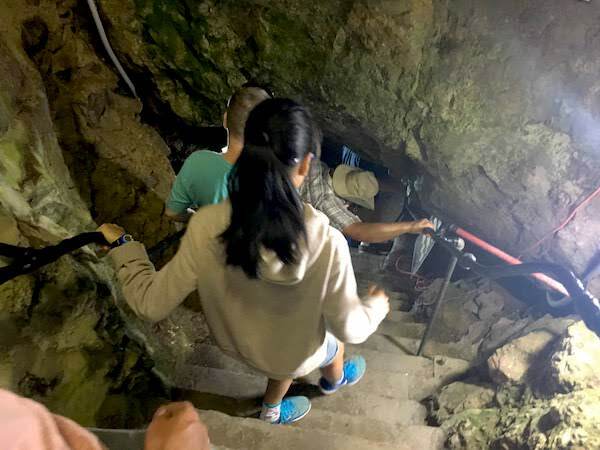 And, if you’ve got kids along, please make sure they hold the rails and take their time going into the cave. A little girl (about 7) ran ahead of her family on our tour, slipped on one of the steps and crashed into my son. His athletic skills saved them both from falling. Descending into the cave. Be careful. 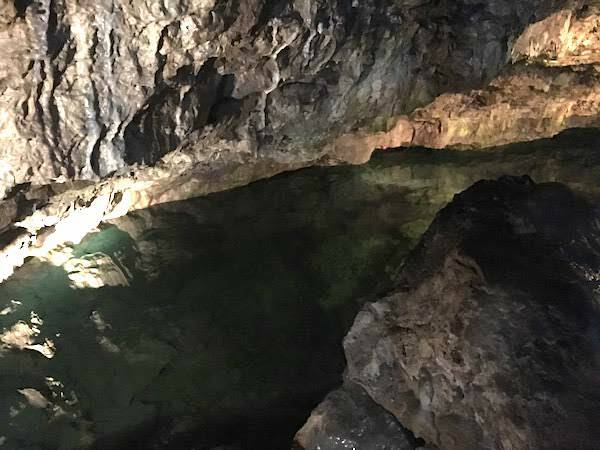 Perry’s Cave Lake. Pristine looking, but not safe to drink. 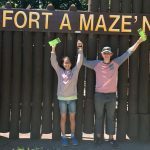 Finally, we headed to Fort aMaze’n. It’s a lot like a corn maze, except it’s a permanent structure. We opted to race through the maze, kids vs. parents. I honestly expected to win (yep, competitive), but the kids beat us by three full minutes. Fort aMaze’n took us only ten minutes total, but it was so much fun. If you complete the maze in five minutes or less, you get free ice cream! 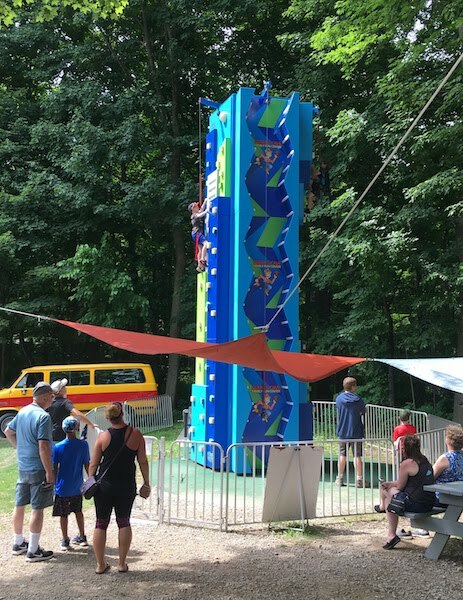 Even though the kids beat us and we didn’t finish in time to win free ice cream, this was our favorite of all the Put-in-Bay activities we tried. Since we didn’t win ice cream, we left Perry’s Cave Family Fun Center and headed to lunch. We scoped out restaurants in advance and had planned to get a light lunch at the Village Bakery and Café, but we got there too late and their lunch items were sold out! I guess when a place has a 5-star rating, diners should expect it. So, we were left with a dilemma, unsure where to eat. 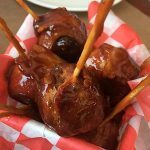 We read menus at restaurants along Delaware Avenue and decided to give T & J’s SmokeHouse a try. Fun staff + tasty food = Awesome decision! Ellie and I split bacon-wrapped barbecue meatballs and fried dill pickles. The two appetizers made a great lunch for two. 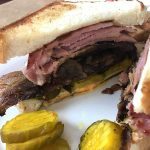 Ben, who will always order a Cuban if it’s on the menu, ordered — you guessed it — the brisket Cuban. 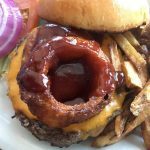 Rob got the Outlaw — a juicy Angus beef burger topped with cheddar, BBQ sauce and an onion ring. Before we left, our server even gave us drink refills for the road. We headed off to our next stop satisfied and happy. 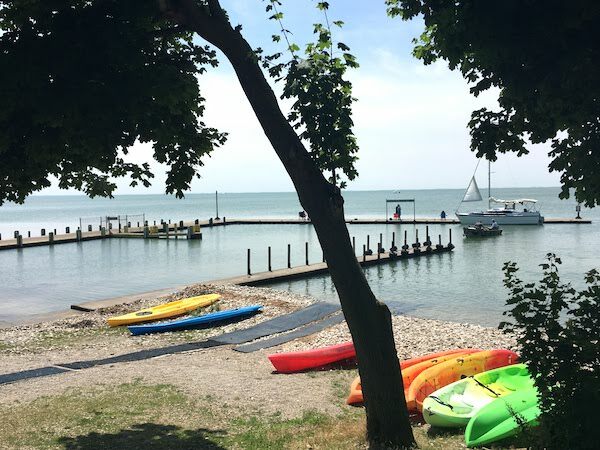 We took a leisurely drive over to Put-in-Bay Watercraft Rentals at 1523 Catawba Avenue. They rent kayaks and stand up paddle boards, jet skis, and power boats. All guests must use life jackets. To rent jet skis and boats, bring your driver’s license and boater safety certificate (if you have it). If you don’t have a boater safety certificate and were born after January 1, 1982, you have to complete a safety test before you can rent them. We took a boater safety course when we bought our boat, and I highly recommend that all people who use motorized watercraft do the same. Those safety rules aren’t just for you, but for everyone who shares the water. First, the staff fits each person to a lifejacket and assists in both the kayak launching and return. They ask that boaters stay within view of the rental hut. Since we kayak a lot, I would honestly have liked to venture further, though we had fun exploring the sheltered bay. If you’re new to kayaking and paddle boarding, this is a great place to learn. 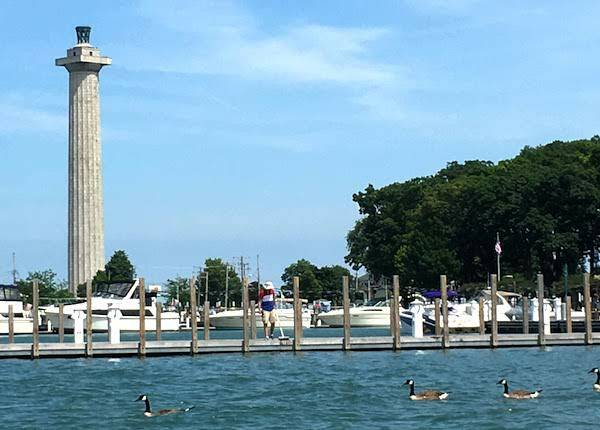 Put-in-Bay is an adorable town that takes advantage of its place on Lake Erie to full advantage. Along Bayview Avenue, DeRivera Park offers lots of green space, picnic tables, fountains, playgrounds and public restrooms where families can enjoy a relaxed afternoon while enjoying expansive lake views. 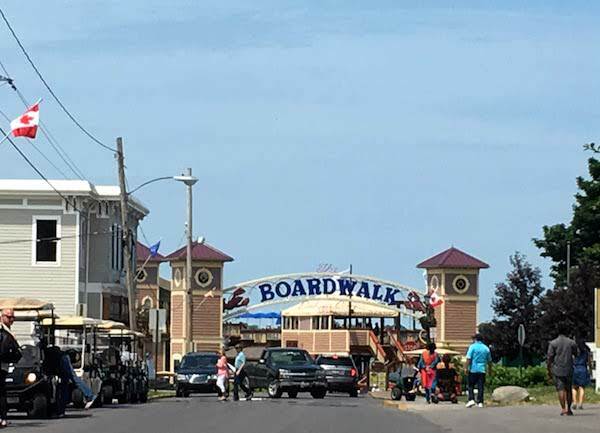 The waterside of Bayview Avenue has restaurants like The Boardwalk, several bars, the marina and adorable shops. We stopped in to listen to live music and checked out the boats docked in the marina. On weekends, this is an adult space — not for people under age 21! There’s a ton of space to park golf carts along Perry Park. And, you can get some great views of Perry’s Victory & International Peace Memorial (which we didn’t have time to visit — next trip). From there, we returned our golf cart and took a ferry ride back to the mainland, full of happy memories and ready for the next adventure. 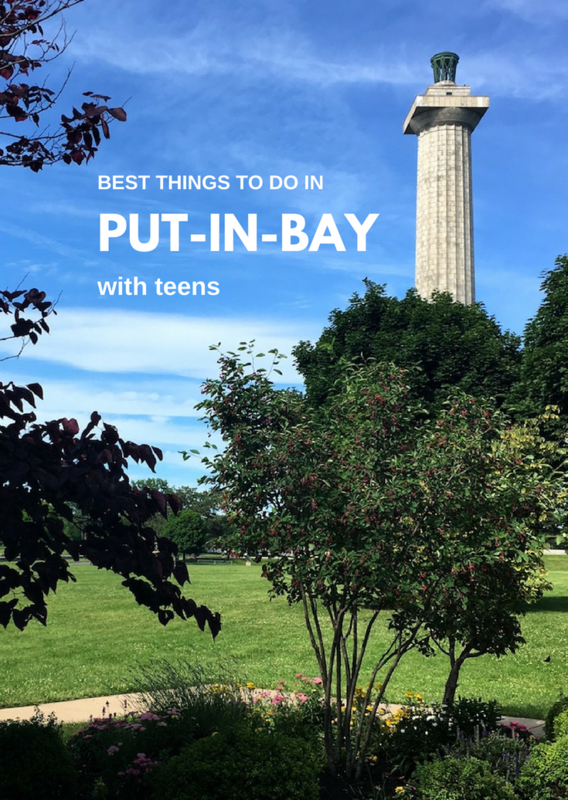 We think we found the best things to do in Put-in-Bay with teens, but if you need more ideas for your family, there are tons of other options! Check out this itinerary, shared by my intern last summer, for more ideas. 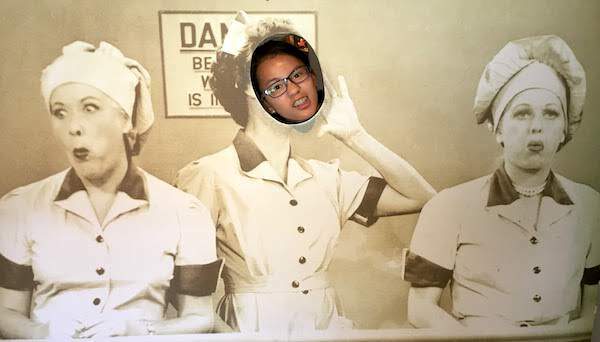 Grab a treat — and a silly photo — at the Chocolate Café and Museum. We stopped in for a quick look! Tour a vineyard or two — Make it romantic and leave the kids at the condo! 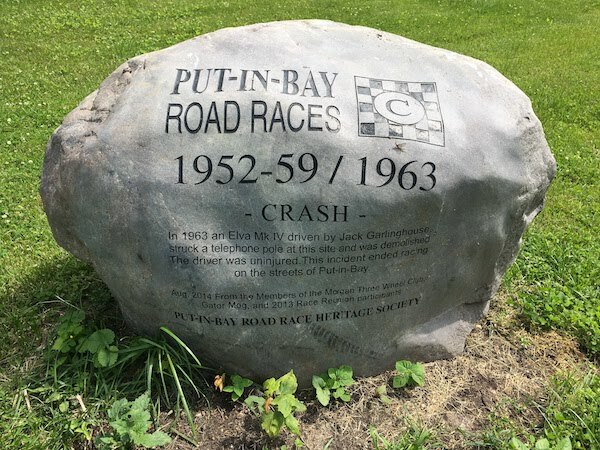 Be sure to check the Put-in-Bay calendar of events before you plan your trip. Some events are not as family friendly as others. Or, you might find an event you don’t want to miss. 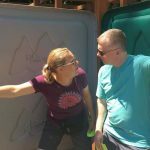 We drove from Kings Island in the Cincinnati area to Put-in-Bay (about 4.5 hours) and spent the night on the island before our day of adventure. If you want to spend the night, make sure you get to the ferry early enough. If you’re taking your car, that’s really important as the wait can be long. Lodging options include Put-in-Bay hotels on the island, rental houses and condos. For our visit, we stayed at Put-in-Bay Waterfront Condos, one of the properties managed by Island Club Rentals. 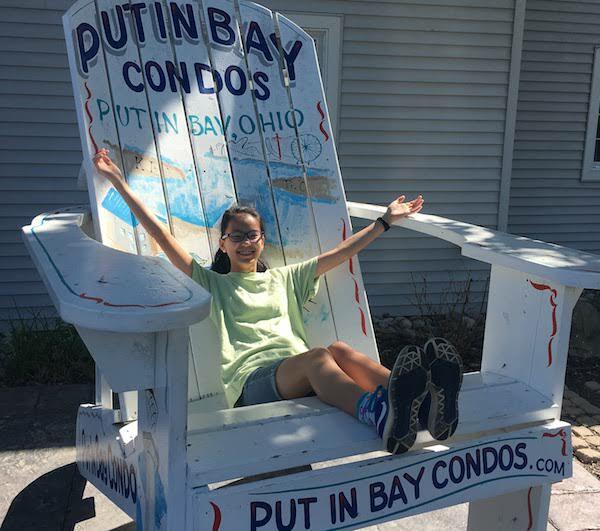 The condo, which is located near the airport — a few miles from downtown Put-in-Bay, has four large bedrooms (sleeps 12) and three bathrooms. The living room and kitchen provide space to prepare meals and relax, but they aren’t really big enough to hang out. 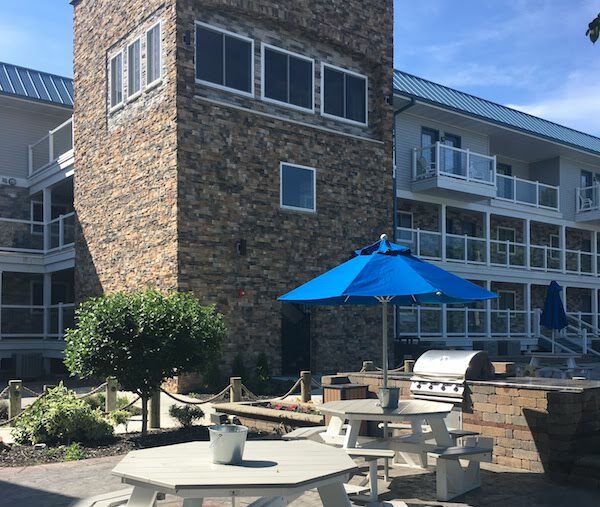 The only indoor dining is 4 bar stools at the kitchen counter, and there is a huge table on the balcony that comfortably seats 8 and a BBQ grill area that has tons of picnic tables. The units come with basic kitchen appliances and dishes, bath towels and washcloths and sheets and blankets. Everything else you need, you provide. A note to home cooks: At this time, they don’t provide hot mitts or kitchen towels. If you plan to cook your own meals, plan ahead! We found the furniture to be quite comfortable and slept soundly on the comfy beds. The property also has a huge resort pool, a beach and amazing views of Lake Erie from private decks. Island Club Rentals regularly offer specials, especially for midweek stays, so check those out before you book. While the units are pricey, when families share the cost, they are quite reasonable. To plan your overnight stay, explore Island Club Rentals here to find the unit that best fits your needs. 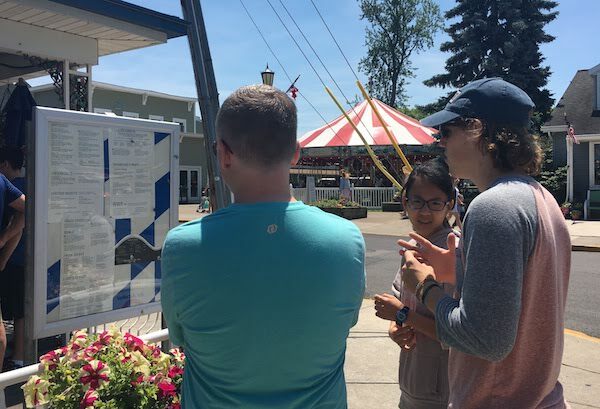 Portions of our visit to Put-in-Bay were hosted by Miller Ferry, Lake Erie Shores and Islands and Island Club Rentals, but all opinions are our own.